Why can not I close the window when I validate TextBox with ErrorProvider in C #? I'm doing validations in C # with ErrorProvider. Validations are about TextBox . //Llama al método valida para decidir si el TextBox está vacío. //Método que recibe un textbox y un Error provider para validar si el textBox esta vacio. The problem I have when the ErrorProvider is activated so to speak. If the TextBox that I'm validating this empty shows the ErrorProvider , and the cursor stays in that TextBox empty waiting to be validated again. Why can not I close the window when ErrorProvider is active? Why can not I give Tab or change the cursor while ErrorProvider is active? It's a desktop application made in C #. 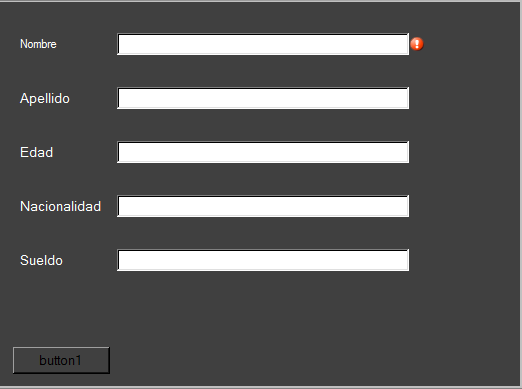 When the form has that error sign, I can not change the cursor, let alone close the window. EDIT2 In the event Form1_FormClosing of the form I did what @JLPrieto e.cancel = false; said, which works only when the X of the form is pressed and the form closes. But if I do it from the button1 this.close() it does not close the window when I press the button. Well, the problem here is that the property Cancel of CancelEventArgs when set to true , will always block any event that occurs after the Validating event. In this case, the conflicting events are Form.FormClosing , Button.Click and KeyPress that prevents you from seselccione the next control with Tab , since I was testing with your code and effectively, the event Click of your cancel button is never executed (I tried with a MessageBox), nor the event% co_of%. Use the Control.CausesValidation property , is a Boolean that obtains or sets a value that indicates whether the control causes validation of all controls that require validation when they receive the focus. And if the property FormClosing is set to CausesValidation , the events false and Validating are deleted.